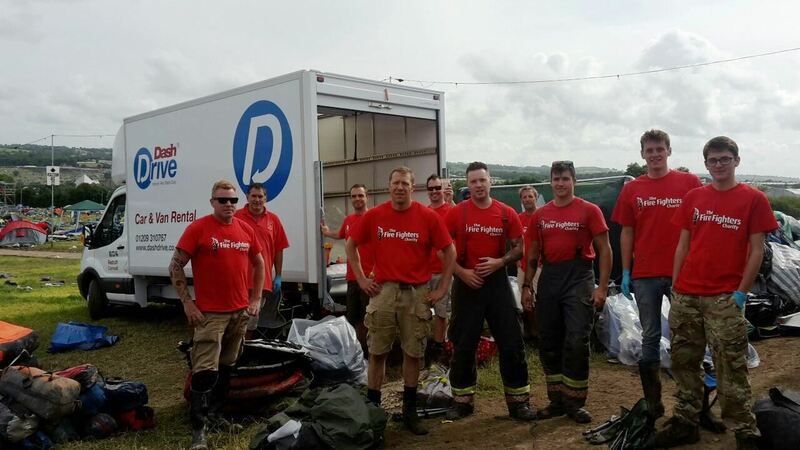 This is the fourth year that firefighters from Tolvaddon and Hayle Fire Stations have travelled to Glastonbury – not for the festival, but for its aftermath. They go to collect as many of the thousands of tents abandoned by revellers, and later sell them in aid of The Firefighters’ Charity. Dash Drive again loaned vans for the massive tent and camping equipment collection, receiving copious gratitude by the firefighters involved. “Thanks Dash, once again a quality and reliable part of our project this year”, they posted on the Reclaimed Tent and Camping Equipment Sale Facebook page. Ah, cheers guys, it’s a pleasure! Before they can be sold, the tents all have to be cleaned – no mean task, especially as this year’s festival was exceptionally muddy. The sale takes place at Hayle Rugby Club on 25th July, and the team is confident of raising around £6,000 for the charity.